Some readers were skeptical when we suggested in December and again in early January that stock indices might need to make another high this year before putting in a real top. It’s still not a certainty, but the prospects for a new high look much better now. Even though we wrote about the possibility of a bounce in mid-December, we also noted that a break of support near the center of the channel and the 1×1 measurement of the w-x-y pattern at 11680 would make for a nice short trade. 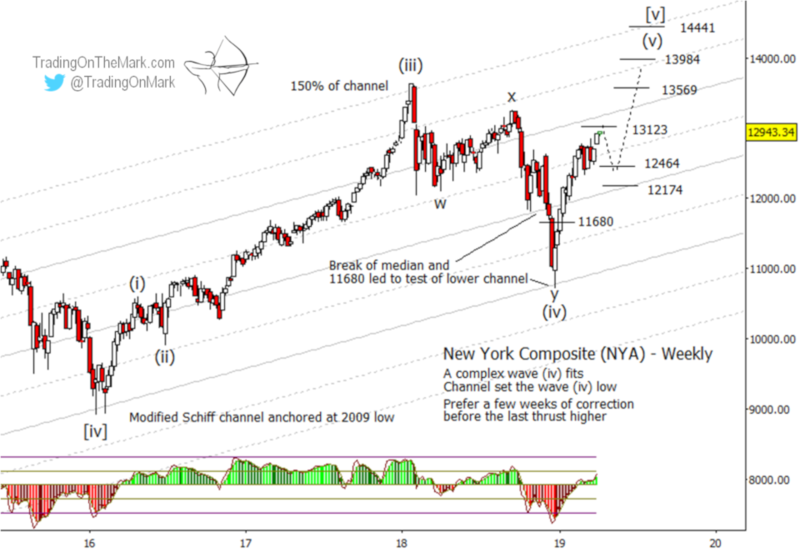 Soon after the post was published, the New York Composite Index (symbol NYA) broke beneath the supports and moved rapidly to test the lower channel boundary. Soon after NYA tested its lower channel boundary, we also wrote about the prospects for moves higher in the iShares Russell 2000 ETF (NYSEARCA: IWM) and the nicely formed corrective pattern in the Dow Jones Industrial Average. For all the indices, the climb from December’s low has been very impressive. The chart included here shows some areas to watch in the NYA for an upward impulsive move to find resistance and eventually to put in what we expect to be a fairly durable high. As we noted in the earlier posts, we view the December low as an Elliott wave (iv) of a five-wave upward sequence from early 2016. The bounce from December represents part of wave (v) of the sequence. It is not yet clear where the count of sub-waves stands inside upward wave (v). However it is still possible to identify various Fibonacci levels that can act as stepping stones for trades. If resistance at 13123 holds on first test, then a small downward retrace could take the index to 12464 or 12174 before the next upward leg begins. Similarly, tests of resistance at 13569, 13984, and 14441 could produce either consolidations or reversals. Note also how those resistance areas fit with the harmonics of the upward-sloping channel. Trading with the right charts gives you a real edge. Readers of our free emailed newsletter receive exclusive charts, analysis and opportunities to save on TOTM subscription packages. You can also follow Trading On The Mark on Twitter for chart updates.